I make it around this time of year with fresh, undried beans - coco blanc and coco rouge - that we can buy at the markets here. They are so gorgeous, before and after shelling. However, it's probably a lot easier for most people to get a hold of dry beans so the recipe calls for them. If you can get fresh beans, just use twice as much - 4 cups total - and skip the soaking and pre-cooking part. This makes a big potful, enough for 8-10 servings at least. Pistou - basil purée. Recipe here. In a very large pot, heat up about 4 tablespoons of olive oil. Add the chopped up leek, celery and carrot, and sauté until the vegetables are limp. Add the garlic and thyme and sauté for a few more minutes. Add the bay leaf and zucchini. Add the tomatoes and stock or water. Bring up to a boil, then reduce to a simmer, and cook for an hour or more until the beans are tender. About 30 minutes in, add the green beans. If the liquid evaporates too much, add a little water or stock. Season with salt and pepper to taste. Serve with a spoonful of pistou drizzled on top, plus the optional toppings if you like. Note: You could use canned beans, though I don't recommend it. 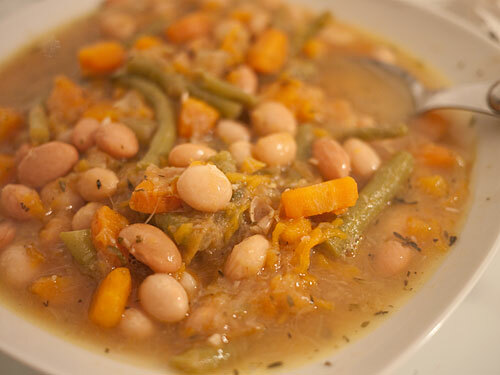 If you do use them though, make the vegetable soup then add the drained canned beans around 30 minutes from the end of cooking time. Many soupe au pistou recipes call for the addition of potatoes, but I prefer to leave them out here because they tend to melt into the soup and make it somewhat well, potato-ey. Fennel is an interesting addition. Here's a variation I made a few days later, using cut up winter squash or pumpkin (I used a squash called muscadet, which is similar in texture to butternut squash) instead of zucchini. I used tomato sauce made from orange-yellow Ananas tomatoes here. 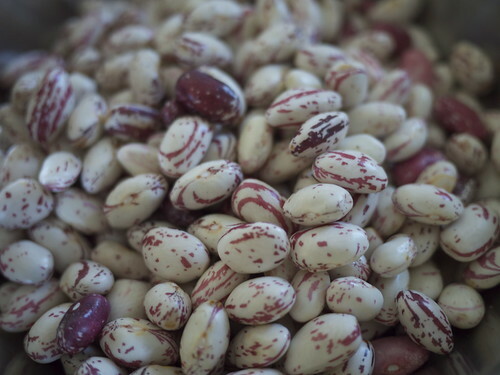 Soupe au pistou made with these fresh beans is so delicious - the beans have a lovely creamy texture. Submitted by maki on 2010-09-29 15:09. Thanks for this recipe! It's starting to get really cold here and I can't wait to make this. 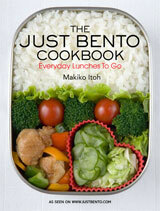 I might try it if I get a slow-cooker or something. Gosh, I hope you get a kitchen soon. I love this soup! it looks delicious. I'm going to have to try this recipe. What can I substitute for the cranberry or borlotti beans if I can't find them? You can just use all white beans instead. 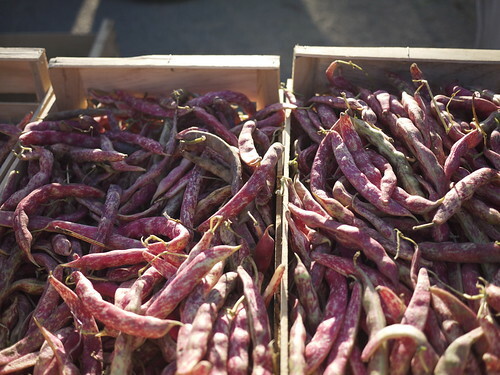 Pinto beans are an acceptable substitution for borlotti beans. If you're using fresh beans, do you have to cook them beforehand? Looks delicious, and perfect timing for the north! P.S I hope you are feeling better and recovering well yourself. 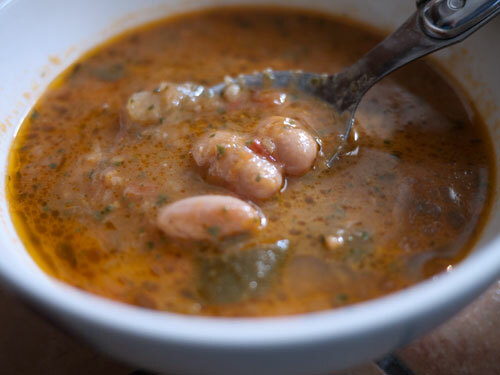 I happened to have a pound of borlotti/cranberry beans so I made this soup late last night I wanted to let the flavors meld. It tasted so good that I ate a bowl before bed! I used a little guanciale and maybe a 1/3 cup mild sausage formed into little meatballs. I can't wait to eat this soup tonight! Great recipe! Thank you. Thanks for the recipe. ITs very good. Super! I have now shared this with my friends. On saturday we will have very nice party. Thanx for good receipt!